Sumbul is a perennial herb; its thick, brown, spongy rootstock produces a stem with alternate, pinnately decompound leaves with thread-like segments. 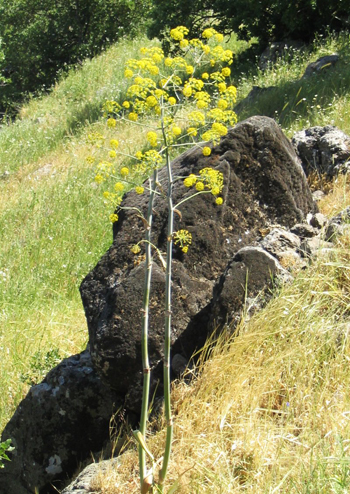 The small, yellow flowers grow in compound, many-rayed umbels. Another variety: Ferula assa-foetida commonly called asafetida. Native to central and western Asia. Useful for asthma and bronchitis. Has been used for hysteria, hypochondria, and for general debility (neurasthenia). The rootstock has a musky odor that is a good substitute for musk oil. Infusion: steep 1 tsp. rootstock in 1 pint water. Take in mouthful doses, 2 to 3 times a day. Tincture: a dose is from 2-5 drops.